Author’s note: though this post — which is biased by my American perspective — strives to be objective, any opinions expressed here are my own. For women and minoritized individuals, the current state of affairs is undeniably bleak. Today’s astrobite, bolstered by the June 2018 National Academies of Sciences, Engineering, and Medicine (NAS) report on the sexual harassment of women, strives to honestly (albeit broadly) depict the current climate for women in STEM fields. If you’re ready to stop reading, at least remember this: we’re living through a period of rapid change in terms of the visibility of abuse in academia. With statistics and experience pointing to a consistently toxic climate for women — especially women of color and other minoritized groups — it’s becoming impossible for institutions and individuals in power to ignore the swell of pushback against systematic discrimination. The past few years have brought a sea change in public awareness of sexual harassment in academia and the workplace. Between the #MeToo movement (first coined around 2006 by activist Tarana Burke, but predictably co-opted and popularized by celebrities in 2017), the backlash against the appointment of Brett Kavanaugh to the U.S. Supreme Court, and the extent of sexual harassment in Astronomy finally being brought to light, we’ve been exposed to realistic depictions of the experience of women like never before. I recently attended a workshop called “Reducing Sexual Harassment at UVA: A Day of Discussion” (UVA is the University of Virginia, where I’m slowly completing my PhD). To clarify, “sexual harassment” here refers to gender harassment (discrimination), unwanted sexual attention, and sexual coercion; of these, gender discrimination is by far the most prevalent manifestation (see Figure 1). The keynote speaker, Georgetown University School of Medicine’s Dr. Liza Gold, was a member of the team responsible for the NAS report. 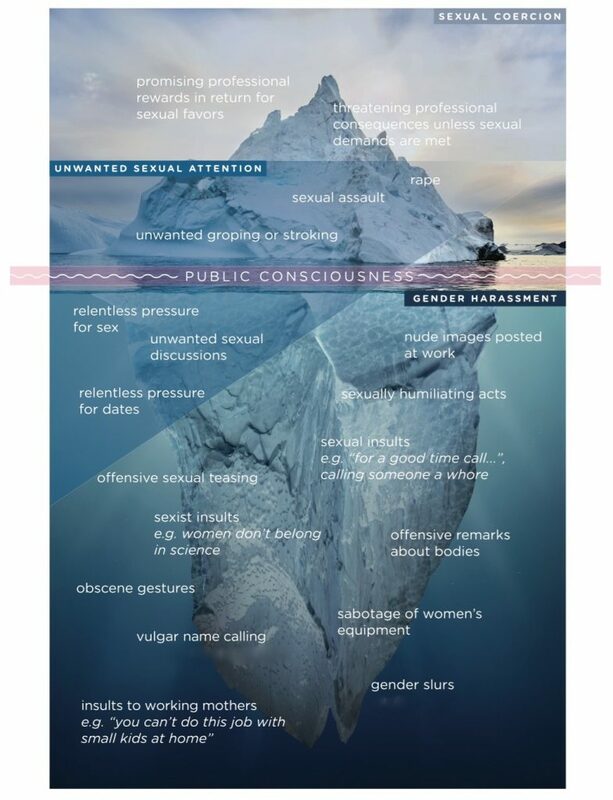 Figure 1: Sexual coercion and unwanted attention are often seen as the dominant forms of harassment; however, gender harassment is more impactful than people realize because it is far more pervasive and its effects can be more subtle. Figure 2-2 in the report, edited to remove language that may be inappropriate for young readers. Harassment of women in academic science, engineering, and medicine is common — between 20 and 50% of students and more than 50% of faculty have experienced it. Women of color experience harassment (of all types) at higher rates than white men and women as well as men of color. “Sexual- and gender-minority people” experience more sexual harassment than “heterosexual women” (quotations denote language used by the report). Sexual harassment in the classroom and workplace is a detriment to the mental health and physical well-being of women. It frequently causes them to leave their field of study as both students and professionals. The least common response to sexual harassment is formal reporting. This is often due to fear of professional consequences and retaliation. Dr. Sherry Yennello, a nuclear physics professor at Texas A&M, shared a physics-specific perspective in her talk, playfully titled “An orbital of her own: improving the environment to decrease the crystal-field splitting energy so no one is forced into alignment.” She highlighted new programs to promote inclusion such as the Allies Program, spearheaded by members of the American Physical Society’s Division of Nuclear Physics (read more about a comparable program called Astronomy Allies here). In recent years, professional societies such as the APS and the American Astronomical Society have begun to require active agreement to an anti-harassment policy in order to register for meetings. Other practices, such as encouraging participants to indicate their preferred pronouns on nametags and the appointment of “safe” allies who will properly deal with reports of misconduct, have been employed to combat poor behavior. Harassment at professional conferences, however, still abounds. Perpetrators, institutions, and systemic discrimination are exclusively responsible for sexual harassment and its consequences. Dr. Gold emphasized that, although adherence to the legal system (for example, via Title IX in the U.S.) is a necessary factor in fixing our current crisis of harassment, it is by no means sufficient (ever clicked through a required sexual harassment training without paying attention?). One such deficiency is the “mandatory reporting” requirement of Title IX, which designates university employees who are required to report any disclosure of sexual harassment to the Title IX office. This means that professors (who are sometimes seen as trusted confidantes) are forced to warn students that they cannot speak freely about experiences with sexual assault and harassment in their presence. According to Dr. Gold and the NAS report, entities responsible for enforcing legal compliance misjudge the extent of the problem by relying on formal complaints of sexual harassment. Despite the failings of institutional policy in these cases, social action is still having an impact. The U.S. Equal Employment Opportunity Commission, for example, reported a 12% increase in harassment complaints during the year following #MeToo and a doubling in visits to their sexual harassment website. Regardless of chosen field or career stage, it is imperative that allies and institutions step up and accept responsibility for our culture that tolerates sexual harassment. This not only requires you (as a student, faculty member, or otherwise) to self-educate, but also to believe your colleagues when they confide in you about their experiences with harassment. Women are attending graduate school for STEM fields at higher and higher rates. Let’s keep it that way — and take steps to forcefully combat the oppression that makes the experience of women and minoritized groups so much harder. Ready to learn more? Astrobites frequently covers issues of inclusivity in Physics and Astronomy. A few relevant bites can be found here, here, and here.